The Handmaid's Tale, which was first published in 1985, is a work of speculative fiction that depicts a dystopian future world. Author Margaret Atwood penned a novel that described a near future where the rights of women had been completely stripped. Women in the Republic of Gilead have no autonomy. Unfortunately, this future is becoming more and more of a possibility. In The Handmaid's Tale the former United States is now the Republic of Gilead, controlled by a theocratic dictatorship called "The Sons of Jacob." The Sons of Jacob rose to prominence after an alleged terrorist attack (blamed on Muslim extremists) killed the President of the United States and the majority of Congress. In the chaos that followed, The Sons of Jacob launched a revolution and suspended the United States Constitution to restore order. In actuality, the suspension of the Constitution as a catalyst to peace was a pretense for The Sons of Jacob to freeze women's bank accounts and dismantle the rights of women. The Government under The Sons of Jacob then quickly restructures American society to a militarized, hierarchical order based largely on social and religious conservatism found in the Old Testament. Under the Republic of Gilead, an area of the country is now called "The Colonies." Those who are sent to The Colonies (as they are a source of punishment) are interred in forced labor camps, in which those who reside in them are forced to clean up radioactive waste by hand with no protective gear. Society within the Republic of Gilead has no tolerance for individuals who are not Christian, people of color, or the LGBT community. Black Americans in the Republic of Gilead are called The Children of Ham and are relocated to the American Midwest. This is reminiscent of both the Trail of Tears and Apartheid-era South Africa. Those who practice Judaism are also called the Sons of Jacob, and are forced to convert to Christianity or emigrate to Israel. Historians that study the Republic of Gilead later reveal that the some of the emigrating Jewish population that were transported by ship were murdered by being thrown overboard into the sea. Practicing Judaism in the Republic of Gilead is punishable by death. The LGBT community in Gilead are also executed, as those who engage in sexual activity with their own gender are labeled "Gender Traitors." Gender Traitors are executed or sent to the Colonies to die an excruciatingly slow death. The genders in the Republic of Gilead are divided and live in separate spheres. The Republic of Gilead divides women into six castes in legitimate society. There are also two sections of women who reside in "illegitimate" society. All of the castes are separated by the color and style of the required dress codes that they wear. Of the two, readers of the Powder Room might find the Handmaids and the Jezebels most interesting. 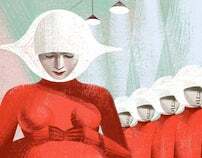 Handmaids are fertile women (which is rare in the Republic of Gilead, as most individuals are sterile from pollution and untreated STI's) whose sole function is to bear children for the Wives, the Wives being the spouses of high ranking party officials. Haindmaids clothing consist of red gowns that are tailored to conceal the shapes of their bodies, along with red shoes and red gloves. Handmaids also wear white wings around their heads to cut off their peripheral vision, forcing them to only see the person standing in front of them. Handmaids are created by re-educating women that have broken the gender and social laws created by the Republic of Gilead. The existence of Handmaids is justified by the Republic by referencing the Biblical story of Jacob and Abraham, who each took his wive's handmaid to bear him children when the wife could not. Handmaids live in constant fear of giving birth to an unbaby, known as a "shredder" in layman's terms. Unbabies are infants born with severe birth defects or with severe physical deformities. Unbabies are taken away and do not last, although Handmaid's are unsure as to where they go. Gilead forbids abortion and prenatal testing to determine if the fetus is healthy and viable to live outside the womb. If a Handmaid cannot deliver a "keeper," or a baby that is born with no birth defects, within three terms of two year assignments, she is banished to the Colonies. This stipulation to the Handmaid's existence has become exceedingly difficult to fulfill, as sterility (a forbidden word in Gilead) among the upper echelon of male society has become exceedingly common, along with the prevalence of birth defects among babies who are brought to term. The Jezebels belong to Gilead's illegitimate class and are women who are forced to be prostitutes and entertainers. Jezebels work in state-sanctioned brothels, which are unknown to the majority of the general populace. Jezebels are only attainable to Commanders (the highest rank of party officials) and their guests. Jezebels are often women who are educated and attractive, but were ultimately unable to adjust to becoming a Handmaiden. Jezebels are also sterilized, which is a procedure explicitly forbidden in all other castes of women. Jezebels are allowed to drink alcohol and socialize with men and are sent to the Colonies once they are past their sexual prime. The name of this caste also originates from the Bible. The division of labor and the caste system of women in the Republic of Gilead causes resentment to form within the female gender as a whole. The legitimate castes of women who are not handmaids view them as being promiscuous (which is nothing but a social construct). The main character of the novel, Offred, laments the fact that in the Republic of Gilead, women do not emphasize with one another, and relish the opportunity to tear each other down, in lieu of uniting to smash the state. The oppression of women via the caste system in Gilead unites women in subjugation, but divides women through their oppression. This future may sound far-fetched, but is arguably becoming more and more possible in the United States. As reported by the Guttmacher Institute, in the last four years, states have enacted 231 abortion restrictions. Guttmacher also indicated that the number of states considered to be hostile to abortion has also skyrocketed, from 13 states in 2000 to 27 states in 2014, with 18 states currently being considered extremely hostile. Guttmacher's most harrowing statistic is one that divulges the fact that more than half of U.S. women of reproductive age in the United States live in states that are hostile or extremely hostile to reproductive rights. The rancor women face when attempting to obtain a simple gynecological medical procedure is an eerie foreshadowing of the world the women of Gilead live in. Jim Wallis, in an article entitled "The New Evangelical Agenda," notes that the religious right in the United States has tied its faith to the partisan political policies of the Republican party. The majority of voters of the religious right are pro-life, anti-LGBT rights, and stricter immigration policies. Ironically, these are tenants that would most likely horrify Jesus Christ. Regardless of whether or not the Lamb of God being repulsed by the hypocrisy being spewed by his followers, the religious right has major voting power within this country. Documentaries such as Jesus Camp and Jesus Politics, The Bible, & the Ballot highlight the voting power within that community. This voting power is akin to the cabal formed by the Sons of Jacob in the final days of the United States, before the country is restyled into The Republic of Gilead. Women in the United States are also united in subjugation, yet divided by oppression. White feminism runs rampant within feminist circles, causing massive divides between privileged white women and WOC. Celebrities like Kelly Clarkson, Taylor Swift, and Susan Sarandon are also hesitant to identify as being feminists. With feminism being deemed a "dirty word" by the upper rung of the entertainment elite, further division and resentment is sown among women in the United States. The disdain certain celebrities have for feminists is akin to the dirty looks and resentment the other castes of women have for the Handmaids in Gilead. With recent assaults on women's health, the LGBT community, and People of Color, the Republic of Gilead rising from a shattered United States of America is becoming a distinct possibility. What can the American populace do to ensure that the rise of a theocratic military dictatorship will never come to pass? Make your presence known at the ballot box, protest the attacks on your basic human rights, and make "nolite te bastardes carborundorum" your credo. Only by teaming together can we rise above those who would grind us down.